Plastic 18 compartment cupcake tray. 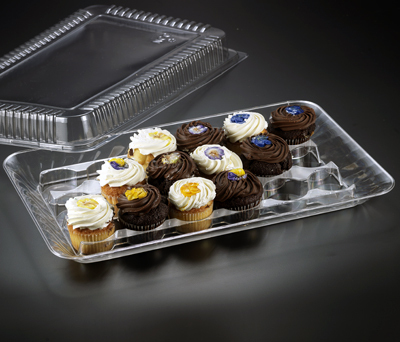 Our cupcake serving tray is perfect way to present cupcakes without them shifting around on a tray or falling over. The tray holds 18 sumptuous cupcakes and is fancy enough to set on the table. Lid not included in the price of the tray. L 18" x W 11.25" x H 1.25"